I shouldn't have to spell out how ridiculous this idea is. The point to inductive charging is that it simplifies the process (though you inevitably wind up having the wireless charger plugged into a wall socket like you would the normal charger). The Palm Pre Touchstone was an exercise in how to do wireless charging right. Even Powermat got it right eventually, ditching the clumsy phone cases for swappable batteries that conduct power when nestled on the charger. To make this technology work, Apple would have to outfit all their earbuds with conductive metal contacts, so they can actually "wirelessly" charge the iPhone just by placing them on top of it. This would mean your expensive Sennheisers, or custom-fit Etymotics? Yeh, they would be redundant if you wanted to charge your iPhone with them. 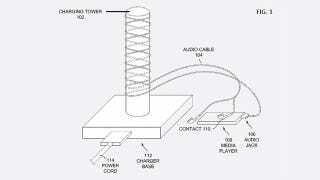 When Apple's goal is simplifying things, I can't imagine a cumbersome, monolithic cat-scratching pole-like charging tower taking pride of place on Steve Jobs' desk. Can you? Especially when you'd have to plug it in anyway, then go to the trouble of wrapping the headphones' cable around the pole, which would convert the AC power into magnetic flux through the ferromagnetic core, as the diagram shows. Apple has also filed a much briefer patent for an "Alternative Acoustic Charger System," which looks more sensible, though it isn't explained as clearly.